Last time, I gave you a glimpse of some of the rites associated with Vedic marriage. Marriage, I reminded you, was seen then as an act that related to the sustenance of Dharma and of humanity. In this venture, the husband and wife were joint stakeholders. This is an important concept and we should make some effort to absorb its essence. Today all such thinking might seem irrelevant and even nonsensical but the ancients had a different view of life and Society. Yes, if the emphasis is entirely on the individual and his so-called liberty to do as he or she pleases, then all these Vedic concepts would appear outdated. On the other hand, if we feel that humans must be in total harmony with their surroundings, then the Vedic concepts do acquire great importance. And press and strain the Soma. Thus they acquire great glory. Both decked with precious gold. One unfortunate thing that has happened in recent times is that the modern generation’s view of the Vedas and Vedic customs has been shaped entirely by what happened subsequent to the early Vedic period. It was in that period that many aberrations crept in, masking the original intentions of the Vedic seers. Few realise that systems and organisations often start off splendidly but later suffer atrophy. This happens whenever people get cut off from the original objectives. Such degradation has happened repeatedly in history, in organisations, in social systems, and in governments; and it has happened all over the world. However, where people have been watchful, systems have retained their original character for extended periods of time. I am mentioning all this for a good reason. 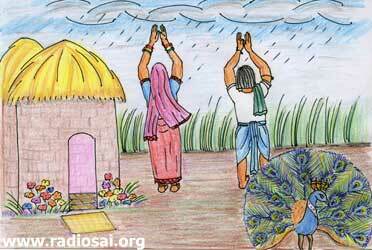 There is a popular belief in India that the Vedas explicitly prohibit women from doing many things. This is not true. In Vedic times, the husband and the wife had equal rights. In fact, Swami sometimes narrates a story relating to King Harishchandra to stress this. I will not go into the whole of the Harishchandra story though it is very important as well as fascinating; my interest in that story in the present context is very limited. Briefly speaking, you may recall that King Harishchandra was being put through a series of gruelling tests by Sage Viswamitra to see if the King really abided by Truth. In one incident, the King is forced to give away all his property to the Sage. When the King prepares to formally hand over, the Sage stops him and says, “You cannot give it away just like that. Your wife has fifty percent share, and she too must consent.” What I am driving at is that the family was a joint venture and not what it became later, a patriarchal one. Swami often talks about education for life rather than just living. In a sense, that is exactly what the Vedas offer. The thousands and thousands of hymns cater to all aspects of life, keeping in mind the centrality of God. Society can never be made up of just geniuses; ordinary people too are very much needed for the existence of Society, and without them Society just cannot function. And these ordinary people, by their very nature and outlook, cannot be expected to understand high philosophy. Yet, they do need a code of life suited to them but based on the highest principles. 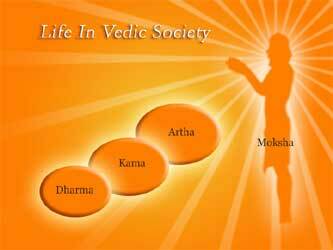 Thus it is there are Vedic prayers for everybody and for every occasion. Let us start with the home. The craving for a home has been there from time immemorial. In Vedic times, the home was seen as an extension of the body, rather than as something that was a property that belonged to a particular person. The home was considered to be the first real extension of man’s world. To take leave of the home was to take leave of the world. Thus it is that the ascetic who renounced the world left the home for ever as a symbolic gesture. Designed and built by the wise. Protect this house, the abode of Soma. Notice the house is not described as the property of the one who built it but as the House of Soma, one of the names of Siva. The main doors Cosmic Order. I take up my abode. To the glory of this House. God is always the sole provider and Vedic seers made sure that ordinary people were continuously reminded of that through various prayers chanted on various occasions. O Father of Storms, may Your favour fall on us! May the hero mounted on his charger spare us. May we speak, as men of valour, a strong word. Desire is a part of existence, and no living creature is exempt from it. Some desires are in-built, like the desire for survival, for example. Feelings of thirst and hunger are so intimately connected with life, that one does not discuss these instincts in terms of desires. But desires there certainly are, like the desire for progeny, desire for house, desire for property and so on. While those spiritually evolved can break free from desires, it is impractical to expect the ordinary folk to do so, including those who have studied the Vedas. Recognising this, Vedic Society sought to regulate desires rather than to totally eliminate them. This regulation was recommended through the Purushaarthas, to which Swami often makes a reference. The four Purushaarthas are: Dharma, Artha, Kama and Moksha. They mean: Righteousness, wealth, desires, and liberation. Notice that the starting point is Dharma. What it means is that whatever it is that one does in life, it must be based on Dharma; no exemptions from that. One may seek wealth, but within the bounds of Dharma. Desires one might have but again within the bounds of Dharma. And if Dharma is made the beacon of life, then one can aspire for liberation from the recurring cycle of birth and death. The constant stress on Dharma is noteworthy. Scholars tell us that there really is no such thing as Hinduism in the sense one has say Judaism, Christianity, Islam etc. 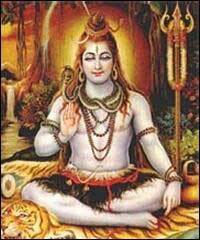 The word Hinduism in fact came into existence only after the advent of the British. What is popularly referred to as Hinduism is actually a way of life called Sanathana Dharma, meaning essentially Timeless and Eternal Dharma. Within a basic framework, Sanathana Dharma offered considerable flexibility. It is also noteworthy that while most religions have a founder, Sanathana Dharma has none. The importance of food for life and existence was fully recognised, and food was thus revered in the Vedic age as the gift of God. Not merely that. All aspects of human activity associated with the production of food were duly sanctified, and all agencies of Nature that assist in food production were duly revered. Here is a sample of the hymns chanted at the time of ploughing the field. The hymns are addressed to Kshetrapati, the Lord of the Field. Food in plenty, that they may be well fed. May the Lord graciously grant us His favour! May the Lord grant us mercy! Plough and ploughshare, to our chant be propitious! And let it fall here on earth. Auspicious furrow, we venerate you. Ploughshare and Plough, grant us joy. 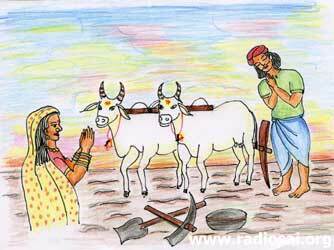 There is in many cultures a thanksgiving prayer after a bountiful harvest but the people of Vedic times, chanted a prayer even as they were ploughing. The renowned Parjanya; win him by your worship. He deposits a seed of life in the plants. The whole world fears his powerful stroke. When Parjanya thundering strikes the wicked. We see him driving his heralds of storm. When Parjanya makes the heavy rain clouds. When Parjanya quickens the earth with his seed. O Parjanya! Grant us protection. You are Divine our heavenly Father! Rain is necessary no doubt, but too much rain can also be a problem. So, there is a special appeal when the downpour is excessive. Now withhold it we pray you! You have made the deserts fit for travel. To serve as food you have made the plants flourish. This is just one example from the vast collection that the Vedas represent. Every gift of God is respectfully acknowledged. Poets have written about rain and storm but one does not hear of thanksgiving to every aspect of Nature in this vein. I may be completely wrong but till today, I have not come across any adoration in any other culture that matches that which can be found in the Vedas. It is amazing that nothing auspicious or good was ever done without first propitiating the gods. Mercifully, at least some of these customs have survived to this day. When a child is born, there is a remembrance of the Lord and prayers addressed to Him. I have already made a reference to this in an earlier article [Click here to read that again]. There are similar expressions of gratitude at every stage in the child’s life, for example, when it is given a name, when it is given the first morsel of solid food, when it is taught the first alphabet, and so on. 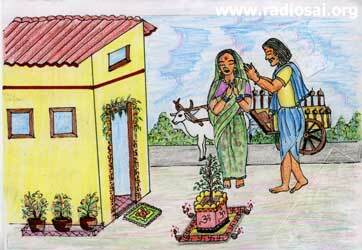 When a house is built, there is a ritual called Bhoomi Pooja at the time the ground is broken. Likewise, when the house is completed and is to be occupied, there is a similar ritual involving thanksgiving. So on it goes. Today’s sceptic might argue: “All this might have been OK in an age when we did not understand the forces of Nature, but they are clearly meaningless in today’s world.” This view stems basically from the negation of the Creator. Swami says, if there is a watch, there surely must have been a watchmaker. If a small thing like a watch needs a maker, does it not follow that the Universe too must have a Creator? Could it have popped from nowhere just like that? We see here a fundamental difference in the outlook of people of modern times as compared with people of the Vedic era. The modern outlook is largely analytic, where the whole is seen in terms of parts. The Vedic approach is just the opposite, being entirely holistic. Everything - man, Nature etc., is seen as an integrated whole, with God in the centre. God thus is not only central to everything but also most essential. 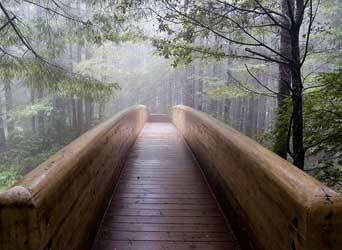 Anything, or activity, without God was just inconceivable. Praise to the Breath of Life! Breathing both in and out! To the whole of you, praise. Whether they breathe or not. Of all that moves, is he Lord. Breath of Life, do not forsake me. I bind you to me that I may live! Raimundo Panickkar, whose work, let me remind you, is what I am basing these talks on, says the phrase “You are indeed I”, is an echo of Upanishadic philosophy that the individual is in fact God. This is an important point. Life is God, and when Praana is equated with the Self, it means Self is God. Let me next consider Time. St. Augustine says, “I know what Time is but cannot describe it.” A modern physicist would describe Time as one of the four dimensions of space-time. 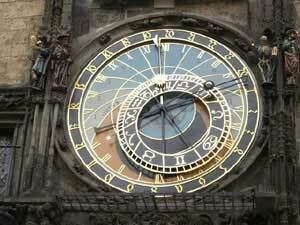 But for people of the Vedic age, Time was verily God. Here are a few verses in praise of Time. In Time is concentrated Name. All creatures with gladness are filled. In Time is energy, in Time the highest good. In Time is the holy utterance. The Father, he of the Creator. From Time comes the self-existent. Energy likewise from Time derives. Time is embodied and also bodiless. In what, however, is this same Time cooked? He who knows this, knows the whole Vedas! With today’s scientific knowledge, we may pick holes here and there in the above verses, but no one can take away the fact that the ancients revered Time as God and also understood that Time itself was a creation of the Absolute God. Superstition, stupidity? So it would appear from today’s perspective but from the holistic point of view that dominated Vedic life, such adoration and acknowledgement represented the height of wisdom. Whereon our forefathers have passed before us. The two kings, rejoice in the offerings. Along with your offerings and praiseworthy deeds. And assume a body, bright with glory. As can be seen, there is a clear reference to rebirth. Here are some hymns that make this aspect more explicit. That it may live and dwell here. Of a truth, a man is born three times over. First he is born from his mother and father. While performing the sacrifice that is his share. For proceeding to a new existence. The question might arise: these hymns seem to focus on rebirth whereas the highest Upanishadic truths direct attention to Immortality. That is a valid point, and may be I shall start my next article on that note. For the present, let me hope that I have, to some extent at least, managed to give you a broad brush overview of the Vedic heritage, guided by Panickkar’s monumental work.